Handmade interiors & homewares inspired by the natural world. Our collection is designed, printed & handmade in the UK. Our designs start life as photographs taken by Garry Lomas, from these we take a shape or motif to create silhouettes and surface patterns. 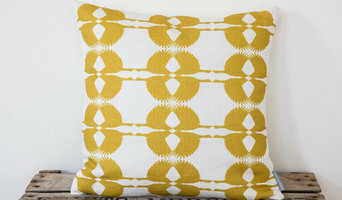 Our range includes fabrics, wallpapers, cushions, lampshades, kitchen textiles & home wares. With showrooms in London, Oxford, and Cheshire, Kitchen Architecture is the largest independent designer of bulthaup kitchens in Europe. The Kitchen Architecture approach is unrivalled in terms of customer service, product knowledge, technical understanding, and project delivery. Our focus is always to add value to your home and lifestyle, using the bulthaup product to deliver beautiful sociable and functional kitchens and living spaces. We strive to deliver a service that surpasses expectations. Our designers are supported by design co-ordinators who are fully trained in Kitchen Architecture design principles. Our project manager oversees your site surveys, liaises with all your other contractors, co-ordinates your team of bulthaup trained fitters, and ensures your project runs smoothly from concept to completion. 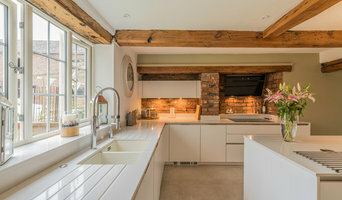 ArtHouse Creative Interiors was established in 2004 in the heart of Alderley Edge, Cheshire by Julie Otulakowski who has been designing flawless kitchens for over 30 years. Not your typical kitchen designers, Arthouse Creative is a multi-award winning interior design company who specialise in luxury kitchens. We are an exclusive SieMatic dealership, carrying their timelessly elegant three SieMatic lifestyles of Pure, Classic and Urban. Our focus is on kitchen designs that not only provide a solution to your needs from a performance point of view, but is an investment for your home and looks fabulous too. As creative kitchen designers we ensure that we take time to understand our client’s way of life, habits, family, and space. Every kitchen created is a unique reflection of each customer’s lifestyle. Visit our showroom today! Tom Howley design, manufacture and install exquisite bespoke kitchens made from the finest materials. Styles range from classic to the contemporary using the highest quality of materials to produce furniture in oak, walnut and hand painted finishes. We offer a tailored design service taking projects from concept to final completion to the highest possible standard. Individually designed to adhere to Tom Howley's exacting principles, our kitchens blend specialist knowledge with the finest materials and inimitable creative flair to realise the perfect space that is both unique and personal to you. Tom Howley work with a number of suppliers to source the finest appliances, work surfaces and flooring to compliment our beautiful kitchens. We have 16 specially developed paint colours available only to Tom Howley clients. Best of Houzz for Design and for Service 2017, 2016 and 2015 We design and install kitchens mainly in the UK having a studio in Manchester. 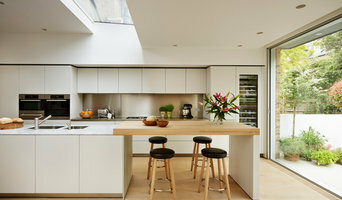 Our team of designers spend time learning all about your needs, hopes and wishes for your room and often work with architects plans to ensure the space flows well and that the perfect kitchen can be created. It takes time and to get a good kitchen and we certainly enjoy spending time with clients making sure that every detail is considered and met. Our website have over 150 completed project for you to view to understand our style. We work with Designer German furniture, Miele and Neff appliances to name a couple. We have won the most design awards of any kitchen business in the UK and are proud to bring our expertise and passion to clients all over the world. The Llama Group is a collective of RIBA Architects, Interior Designers & Construction Division all working together from our prestigious offices in Cheshire, creating International Award Winning Residential and Commercial Architecture and Interior Design Projects in the UK & abroad. Storylines is the Yorkshire based Interior Design Studio of Caroline Wood-Robertson. With an eye for detail, Caroline is passionate about creating spaces attuned to the lifestyle of her clients, ensuring that her designs reflect personality and are loved for years to come. Adding colour and creating spaces which tell your story. Floors of Stone has been established since 2007, originally supplying limestone floor tiles to clients of our sister company, deVOL Kitchens. We now offer a wide selection of natural stone and porcelain tiles at highly competitive prices from our dedicated flooring showroom. We have recently added an exclusive collection of handmade tiles to our range, which have been designed and created in our on-site ceramics studio at our Cotes Mill showroom. Our sister company deVOL Kitchens has been established since 1984 and design and make the finest handmade kitchens. deVOL moved to the historic Cotes Mill in 2013 , which is home to their entire kitchen range, as well as antiques, gifts, interior products and our stunning 145m2 flooring showroom. Cotes Mill is a renowned local landmark and now our customers can view everything under one roof whilst taking in the enchanting character of the mill and gardens. The grounds are full of wildlife, with peacocks, guniea fowl, chickens, ducks and swans roaming the grounds, as well as our family of sweet fallow deer. Today, the deVOL group employs over 130 staff locally and have had their kitchens and flooring featured on Grand Designs and within the pages of prestigious magazines such as Elle Deco, Country Living, Ideal Homes and The English Home. For over 30 years we have been designing unique interiors for our discerning clients, their homes and their lifestyle. Whether it’s a bespoke furniture project or stunning staircase renovation, we can create the perfect bespoke solution that will add value to your home for many years to come. Adhering to the fundamentals of good design and quality workmanship, we’ve grown to become the natural choice for bespoke interiors and staircase renovations. Using traditional techniques, fine materials and the incredible imagination of a talented team, we have progressed to become market leaders in our field. We’re here because we don’t believe ‘one-size-fits-all’. Neville Johnson furniture and staircases are designed around you. We have always listened to our clients and will continue to create solutions that are personal, unique and one-of-a-kind. Scott Donald Architecture is an award-winning practice based in Sale, Manchester. Specialising in contemporary houses, we pride ourselves on our detailed approach to designing stunning spaces for modern life. With careful consideration of a building’s environment, we aim to create striking architecture that reacts thoughtfully to its surroundings. And with complementary attention to the interior design and detailing, we make sure the vision perfectly realises the building’s potential. Irrespective of project size, type or budget, at the heart of every design is our passion to create the unique and distinctive – beautiful living spaces that satisfy, nourish and exceed our clients’ expectations. Such is our desire to deliver, we welcome the opportunity to provide a full service for any new-build, remodelling or extension project. At Sheffield Sustainable Kitchens we design and fit beautiful bespoke kitchens. Our kitchens range from sleek and contemporary, to homely and characterful, but are always individually designed to ensure they work for the way our clients use their cooking and dining spaces, as well as achieving the look and feel they’re after. As a member of the Guild of Master Craftsmen, we pride ourselves on creating highly functional quality kitchens, whilst keeping sustainability and ethics at the core of everything we do. We aim to use sustainably sourced materials, with a high recycled content, depending on the project. Many of our kitchens have a story to tell, whether it’s the cabinet door fronts that were originally railway wagons, open shelving that had a previous life as a school lab bench (complete with graffiti) or worktops made from glass bottle shards set in a solid resin. We offer a personalised service, working closely with you to create the best kitchen design for your needs. Once you have got in touch, we arrange to come out and meet you in your kitchen space and find out what it is you’re looking for. We do a full measure-up, so we can then draw up detailed plans and realistic 3D renders back in the office to help you visualise how we propose the space will look. From here we have a useful springboard to prompt further discussion and finalise your kitchen design. Whilst we don’t currently have a showroom, you are very welcome to visit our workshop in Nether Edge, south-west Sheffield and see how we work. As well as crafting kitchens, we take commissions to design and create bespoke furniture, freestanding or fitted and a wide range of other interior projects from cabinets and larders to offices and wardrobes. To be honest, we relish the challenge to design and make pretty much anything – just try us! Reach out to multiple professionals — especially for larger projects — and don't settle for the first bid you hear. Comparing multiple New Mills, Derbyshire, UK professionals' bids and experiences can help you find the one that’s best for you. Ask a lot of questions now, so you won't have unexpected answers later. Find a home design professional: Narrow down your search by type of professional and location. Browse New Mills, Derbyshire, UK portfolio photos, read client reviews and contact each New Mills, Derbyshire, UK professional for more information. Check out the information in the specialised professional sections too for tips on how to hire the right professional in New Mills for your project.